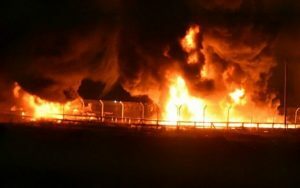 CAMERA’s Israel office yesterday prompted improved Associated Press coverage of the Palestinian destruction of the pipeline at Kerem Shalom crossing that provides gas and fuel to Gaza’s residents. An AP story yesterday initially noted the destruction of the pipeline, but failed to identify those responsible as Palestinian (“Palestinians bury dead after bloodiest Gaza day since 2014“). Following communication from CAMERA Israel office, the AP commendably updated the article to note that “Palestinian vandals” were responsible for the destruction. Another serious shortcoming in the article is that the repeated description of the riots and clashes as “protests,” along with the reference to international criticism of what the AP calls “Israel’s use of lethal force against unarmed protesters” and the absence of reference to the molotov cocktails, guns, knives, axes, wire cutters, explosives, and arsonist kites, is a complete distortion of the nature of the Hamas-led activity at the fence. Not until 14 paragraphs later does the article mention explosive devices and firebombs, and even then this information is qualified as an Israeli claim.